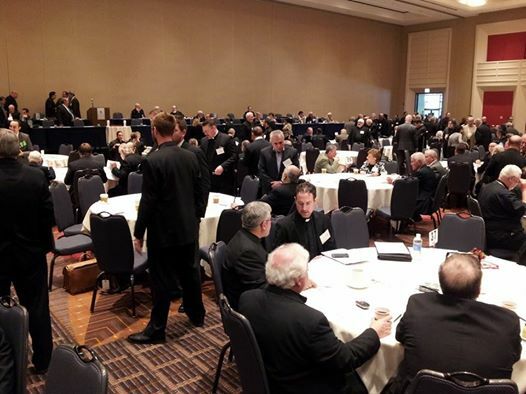 On June 5, 2014, hierarchs, clergy, and laity delegates convened in Chicago, IL at the Hyatt Regency Hotel to participate in the historic Archdiocese Special Convention, with the purpose of selecting three candidates whose names will be submitted to the Holy Synod of the Patriarchate of Antioch for the office of Metropolitan of the Antiochian Archdiocese of North America and Canada. Vicar General for the Antiochian Archdiocese The Very Rev. Thomas Zain was interviewed by Ancient Faith Radio immediately following the vote, announcing that the Special Convention has nominated the following (in alphabetical order): The Right Rev. Bishop Basil, Diocese of Wichita and Mid-America; The Right Rev. Bishop John, Diocese of Worcester and New England; and The Most Rev. Archbishop Joseph, Diocese of Los Angeles and the West and Locum Tenens for the Diocese of Eagle River and the Northwest. “The Synod in Antioch has the right to choose any one of these three as the next Metropolitan. God willing, the Holy Spirit will work among them,” Fr. Thomas said.